Last week, PRI’s Central Asia office organised a conference in Dushanbe, Tajikistan with UNICEF and local partner the Child Rights Centre to raise awareness of the issue of violence against children in closed institutions, share information on regional practice, and to explore the role of the Ombudsman in protecting the rights of children in detention. At present in Kazakhstan, Kyrgyzstan and Tajikistan, there are approximately 30,000 children deprived of their liberty. International standards make it clear that children should only be detained as a measure of last resort and for the shortest possible time. They also state that those who are held in detention are entitled to all of the rights enjoyed by their peers in the community, apart from the right to liberty. Children in detention experience serious violations of their rights in many countries, even when detained for only a short while. They are often held in adult prisons and it is not unusual for children to experience violence, abuse, neglect and exploitation at the hands of fellow detainees and staff. Girls can be especially vulnerable to sexual abuse and exploitation. Children in detention may also suffer from malnutrition; neglect; the absence of treatment for physical or mental illness; psychological trauma; lack of education, rest, play, leisure and other conditions necessary for healthy development; discrimination; interference with privacy and family life; and violation of other civil and political rights such as freedom of thought, conscience, religion, association, expression and protection of their legal safeguards in relation to deprivation of liberty. The conference benefited from the insight of the three Ombudsmen for the region, with presentations from the Ombudsmen for Kazakhstan, Kyrgyzstan and Tajikistan. Their voices were joined by two experts from the Norwegian Children’s Ombudsman’s office who stressed the need for children to be treated differently from adults in detention – not only because there are specific international standards for children but also because of the severe psychological and physical damage they can suffer for the rest of their lives. The conference was one activity in a wider PRI programme spanning Kazakhstan, Kyrgyzstan and Tajikistan funded by the European Union, which aims to prevent the use of solitary confinement for children in detention and to ensure that children are kept separate from adults, and girls from boys. As part of the project, national legislation is under review and training is planned for child care professionals. Ombudsmen play a key part in monitoring places of detention and PRI has developed tools and resources that will be adapted to assist them and other monitoring bodies. At the end of the year PRI’s Central Asia office will also publish a report – ‘Voice of the Child’ – for each of the three countries, which will provide invaluable data on conditions for children in detention. The conference participants expressed a high level commitment to protecting the rights of children and determination to take forward some of the concrete proposals put forward for changing the law and providing strong protection mechanisms – putting into effect the words of Knut Haanes, Deputy Children’s Ombudsman of Norway – ‘to build a strong safety net to safeguard childhood’. 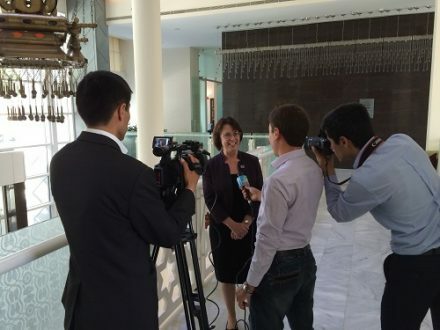 Photo: PRI’s Executive Director, Alison Hannah, at a press interview for the conference. Examines the status of law and policy to protect children against violence in police and pre-trial detention in Kazakhstan.